This growth is characterized by numerous fibrous, serum filled spaces of various sizes. It is developed more commonly in the metaphyseal portion of the long bones, posterior vertebral portions, pelvis etc. When affected in the vertebral portion, it may result in paraplegia (loss of motion specifically in the lower extremities). Aneurysmal Bone Cyst (ABC) is seen slightly more in women than in men. However in total, it accounts for only 1% of all the bone tumours. As of now, no cases of cancerous transformation have been reported. The treatments mainly include grafting of bones and curettage (removal of tissues by scooping them). However the recurrence rate shown by grafting is about 20%-40%. Wide excision (surgical cutting of a tumour) may be necessary to decrease the recurrence rate further. It is a rare bone tumour, usually non-malignant and progresses at a slow rate. It is also called Codman's tumour. Chondroblastoma is one of the most commonly seen epiphyseal tumours in people in the age group of 10-30. In the case of adults, this appears as giant cell tumour. This cell tumour mainly affects the portions of the leg. 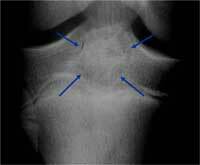 Although lesions are equally distributed in the skeletal, they are mostly found in the epiphysis. Since chondroblastoma may extent widely, marginal excision is a very difficult task. Chondroblastoma is observed to have a high tumour recurrence (almost 35%).The treatment can become more or less depending upon the level of severity (stage 1, 2 and 3). The disorder is regarded as one of the rarest among the bone tumours. It only accounts for less than 1% of all the bone tumours. 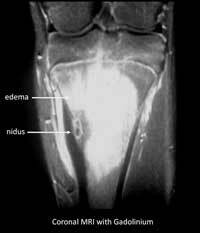 The number of cases of Chondromyxoid Fibroma is statistically found to be almost 500 worldwide. It is most commonly found in teenagers. When compared to females, it is more commonly found in males. Although the exact causes are unknown, some chromosomal disorders are said cause this disorder. Since the word 'Chondro' refers to cartilage, the tumour grows in the tissue that forms the cartilage. These tissues are present in the bone marrow. It may be diagnosed by the presence of an eccentric lesion that appears in the metaphysis. The affected patients mostly feels the presence of bony lump in the affected area .It is mainly formed in the longer bone of the lower trunk such as femur or tibia in over 89% of cases. The chances of metastasis are very negligible. However, a relatively higher percent of recurrence is observed in this case (almost 25%). 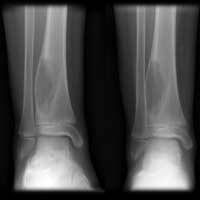 The fracture is considered to be pathological only in 5% of the patients. The treatment usually involves curettage and excision. 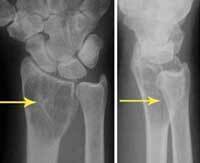 When occurring in the bones, it is called Giant Cell Tumour of the bone (GCTOB). It is named so because of the fact that cells of the tumour are large cells with multiple nuclei. They are similar to osteoclasts. There is only a negligible chance for this cell to become cancerous (2% approx. ).Only one in a million people has giant cell tumour in a year. In the case of malignancy, it almost sure to spread into the lungs. Almost 4%-5% of primary tumour cases are giant cell tumours. Among the benign tumours, its share is 20%. It is more noticed in people aged 20-30. The exact reasons for the onset of the tumour are unknown. It might be related to hyperparathyroidism. Both surgical and non-surgical methods are there for treating it. Radiation is one among the non-surgical therapies. Grafting can also be done, which may be autograft (bone taken from own body) or allograft (bone taken from an external body). Scrapping off the tumour (curettage) can also be performed. This disorder also does not result in cancer. It is characterized by the formation of nidus, a growing cell center. The nidus is circumvented by a hard shell. These kinds of osteomas may occur in any bone and are generally small. However, this affects the long bones such as femur (thigh bone) and tibia (leg bone) more often. However, it does not spread to other parts of the body. People in their early 20s are affected more. The condition is seen more commonly in males rather than in females. A dull pain is the most common symptom present. The intensity of pain increase during the night hours. It can be diagnosed from an X-ray. A thickened bone lining circumventing a core is a unique feature. 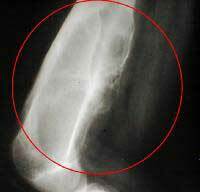 Osteoid osteoma is believed to fade out over a period of time. However, urgency can arise due to the intensity of the pain felt. Often, surgical methods are adopted for treatment. The major procedure is tumour excision. This may be necessary because there may be some chance of recurrence. Nowadays, an innovative treatment approach is developed wherein the central core is removed using techniques that involve minimum incision.